Literacy Loot: Shoes, Totes and Tequila! In an effort to find some interesting items for this week’s post, I challenged myself to find things from places other than Etsy, which is my go to site for all things cool and unique. Honestly, this was a really tough task and I struggled a bit. I hope you like what I came up with! These “Shoes of Note” Flats from ModCloth ($64.99) are too crazy not to share. I loved reading all the reviews, from mostly English teachers, about how excited buyers were to wear these to school. Cute! This “Down the Rabbit Hole” Necklace from Out of Print ($32) is perfect for Wonderland fans of all ages. Calling all Little Women fans! This “Bookshelf Bandit Tote” in “Jo” by Out of Print and listed on ModCloth ($19.99) has an adorable pattern that I love. All of the “Bandit Totes” are worth checking out. The “Greatest First Lines of Literature Ever Mug” from Bas Bleu ($12.95) would be a great addition to any classroom, whether it holds pens and pencils or some much needed morning caffeine! This Tim Federle book would be the perfect adult book club read. Funny and entertaining, this title is listed on Amazon ($11.46). The sequel, Hickory Daiquiri Dock, a cocktail book for new parents, comes out in December. Literacy Loot is back! Literacy minded items for school, home and even to wear! And now, without further ado, here’s this week’s Literacy Loot! This cute t-shirt is from ShopJustWish on Etsy and is $19.95. There are a lot of variations and color choices of this tee and the site also lists some shoes and other clothing items (notebook paper onesies, anyone?) that are worth a look! I love classroom library stamps and think this one is perfect. Listed at $31.50 from YellowFishPaperie on Etsy. These page markers come from The Container Store and are $7.99. I love the packaging and think this would be a fun teacher gift to start or end the school year. The Etsy shop Bright Designscle features 40 really cool literary art prints that you need to check out! They are $18 each and so gorgeous. 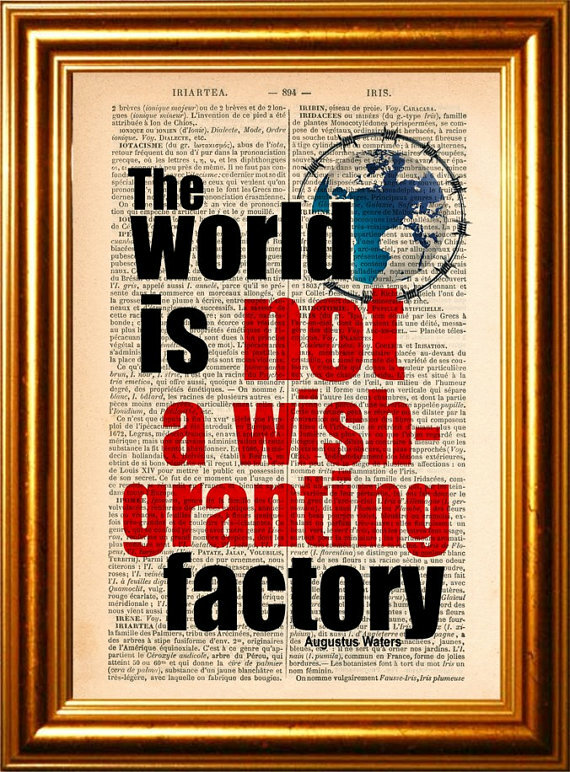 There are quotes from several authors, including John Green, Cassandra Clare, Stephen Chbosky and J.D. Salinger. This upcycled origami crane mobile made of vintage children book pages is simple, functional and pretty affordable at $29. You can find it at Spare Bedroom Studio on Etsy. See you next Friday with more literacy loot! Happy shopping! 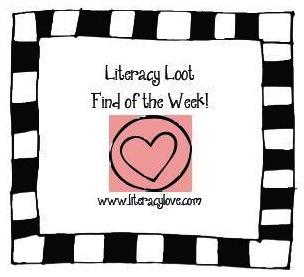 A little bit of everything… A Literacy Loot Smorgasbord! This week’s post features a little bit of everything. I’ve been pinning away and favoriting on Etsy, so here’s this week’s literacy loot smorgasbord! Another cool bookend – this time from graphicspaceswood on Etsy. This wooden alphabet piece is $55 and the wall hanging alphabet linked n the description would make a great companion piece in a nursery. I’m loving this $25.00 t-shirt from Skreened. 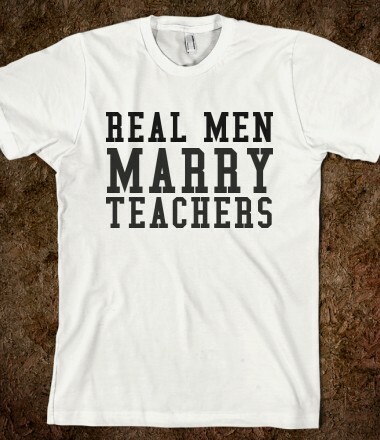 I’m sure there are many husbands out there that would agree that being married to a teacher is one wild ride! 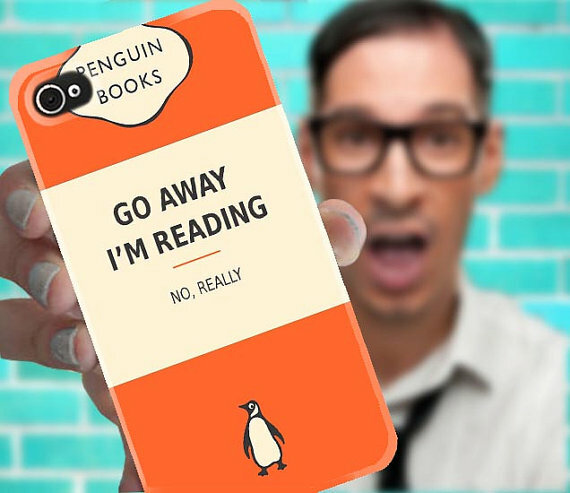 This $18 Penguin Books phone cover from gleeksheeksleek is pretty hilarious. This site has a lot of stuff for geeks worth checking out, like cool Harry Potter signs, a Wicked phone cover and more. ALikelyStory is an Etsy store that caters to all literacy lovers! This bracelet, which uses replicas of old fashion typewriter keys is listed at $27.95, and would be a great gift for bibliophiles. 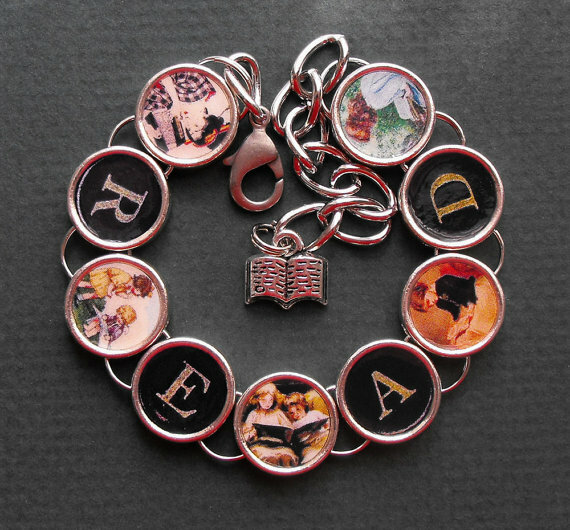 The Bookish Charm Bracelet is worth checking out too! The carboncrusader store on Etsy has some really cool items, and I love this $2 button. What a fun and inexpensive gift for coworkers. I know a few students that would love to get their hands on this too! Literacy Loot: Harry Potter Must Haves and a Book Scented Candle! This week’s post features a few of my favorite Harry Potter items out there that won’t break the bank, and a very interesting candle, too. Enjoy! This $20 Harry Potter themed mug set from KynasKreations on Etsy is great for fans of the boy who lived. Anyone up for a HP reread and some coffee in a stylish mug? I am obsessed with this ABC tote bag featuring so many favorites from this beloved series. Even he-who-shall-not-be-named looks almost cute! Found on Luvocracy for $18.99, this bag is a must for literacy lovers. This handmade coaster set from OhGaud on Etsy is $20 and is also available in all text. This shop also has some cool looking comic book coasters that are worth checking out. This candle is advertised as scented to “evoke the atmosphere of your fantasy library and the pleasure of reading”. Sounds good to me! 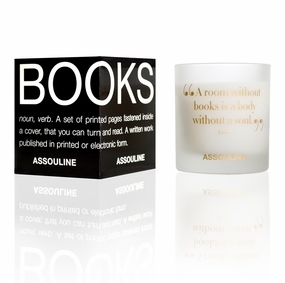 Listed for $49 from Assouline, this candle is definitely the luxury item of the week and an interesting concept for sure.